Welcome to St. Cecilia’s Youth Ministry Program! It is our aim in our youth ministry program to strive to engage our parish’s youth in a personal relationship with God, to equip them to grow in their faith, and to enjoy and share God’s love with others. We seek to surround the youth, and their families, with love and support that fosters genuine relationships and that anchors them in the joy and traditions of the Catholic faith. Following Jesus’ example, relational ministry is the foundational practice to form intentional Disciples of Jesus Christ, and to lead our youth into a life-long journey that is guided by scripture and shaped by the Holy Spirit. Ignite is a Catholic high school youth ministry group created specifically for students in grades 9-12. In addition to Bible study programs, the group takes part in several service projects throughout the year, such as providing meals & cookies at Ronald McDonald House, making blankets for patients at Children’s Hospital, helping to assemble compassion bags for the homeless, and assisting with the St. Vincent de Paul Christmas Food Basket Program. Many members of our high school youth group also participate in The Gospel Road Mission trip each summer with the Diocese of Columbus. Fun and fellowship are always a part of our gatherings. We take several “field trips” together each year such as bowling, canoeing, ultimate Frisbee tournaments, etc. The high school youth group at St. Cecilia typically meets twice a month on Sunday evenings from 7:00-8:30 p.m. Dates & times of all upcoming youth group nights can be found in the bulletin each week or on the Parish Calendar. All high school students are welcome to attend! You don’t have to be Catholic or a registered parishioner at St. Cecilia to join our youth group. Edge is a Catholic middle school youth ministry group created specifically for students in grades 6th, 7th, & 8th. Edge is designed to meet the educational, spiritual, emotional, and social needs of young adolescents. Kids are always welcomed and encouraged to bring their friends to Edge, you do not have to be Catholic or a registered parishioner at St. Cecilia to attend. In many respects, middle school kids are on the edge because so much is going on in their lives physically, mentally, spiritually, and socially. It can be a very stressful and difficult time for them and their parents. As a Catholic Community, we are going to give our middle school youth the edge they need in life: Jesus, The Word, The Eucharist, and the Church! Within the context of faith, middle school youngsters are moving from a child-like spirituality to one that will hopefully reach its pinnacle into an adult faith commitment to Jesus Christ and the Catholic Community. Our Edge group at St. Cecilia typically meets twice a month on Saturday evenings following the 5:00 Mass. We incorporate food, fellowship, and fun into every event. Dates & times of all upcoming Edge Nights can be found in the bulletin each week or on the Parish Calendar. 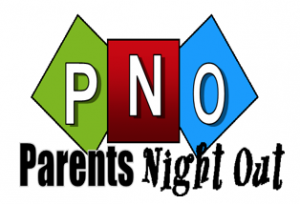 Parents’ Night Out is a program for children age 3 through 5th grade. This program typically meets one Friday evening each month from 6:30-9:00 p.m. throughout the school year, and allows the parents of our parish a much needed night out, while we provide a safe, fun, Christ-filled program for the younger children of our parish. We provide dinner, crafts, Bible story time, music, and games for all age groups. Parents who choose to take part in this program, are asked to volunteer for 1 Friday night throughout the year to help care for the children. Following Diocesan policy, attendance at a Protecting God’s Children class and a background check are required for all adults to assist with the childcare. The PGC class is offered free of charge, and a listing of available classes can be found at www.virtus.org. Only 1 parent per couple is required to volunteer. 8th grade and high school students are especially welcome to help out and earn service hours. For safety purposes, all students need to be pre-registered to attend this program. Please contact Katie Wohrle for more information, or to request registration materials. Diocese of Columbus Office of Youth Ministry, click here.